According to tradition he was the son of the Count of Nevers who ordered him to be exposed in his cradle on the Loire. He was rescued and adopted by Martin, Bishop of Tours, and brought up under his care. 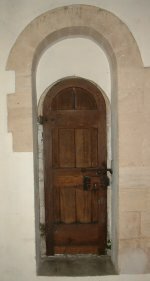 Educated at the monastery of Marmoutier he went on to become Martins’ disciple. In many ways he was a most unsatisfactory cleric. He was proud, ambitious and apparently licentious too. 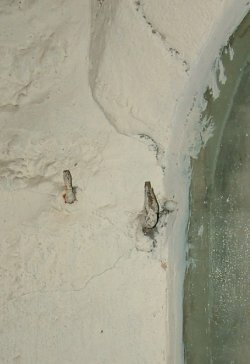 No doubt this was the cause of some friction with his master. During his deaconate he criticized Martin, alleged he was crazy, and accused him of falling into superstition. He was forced to withdraw some of his remarks and ask for Martins’ pardon. Nevertheless, on Martins’ death in 397, he was chosen as his successor and elected Bishop of Tours which, it is said, fulfilled a prophecy made by Martin. His behaviour remained unchanged during his long episcopate and he was accused by his enemies of various faults including adultery. He was driven from his see, went to Rome, repented, and was vindicated by the Pope. After this it seems he was a very different person. He returned to Tours after seven years exile and was reinstated. During his remaining years he was a model cleric which, it is thought, was in conscious atonement for his earlier misbehaviour. Such was the change in him that, after his death in 444, he was immediately proclaimed a saint by his followers. His cult continued and flourished in Tours and eventually spread throughout Europe, including England. His feast day appeared in old monastic calendars but has not always been a cause for celebration. 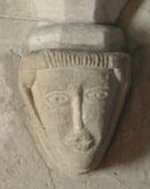 Ethelred the Unready came to the throne in 978 and bought peace with the Danes by paying them money, called Danegeld, and some of the Danes settled in Wessex. However rumours of a conspiracy among the Danes caused Ethelred to order their massacre - which took place on St. Brices’ day 1002. One of the victims was the sister of Sweyn Forkbeard, King of Denmark. He swore revenge and sailed up the Humber, along the Trent, and established a camp at Gainsborough. The West Saxons soon submitted and Ethelred fled. St. Britius is represented as carrying burning coals in a fold of his cloak, which alludes to a miracle which he is said to have performed. The Doomsday Book of 1086 records a settlement here as Nortone. Many different variations of the spelling are recorded over the next hundred years or so. At about this point the name became Northone Brun, again several variations are found, but they all mean ’North tun belonging to Brun’ - William le Brun is mentioned as having land here. Subsequent corruptions such as Brunesnorton and Brimesnorton occurred in the 14/15th centuries but then the format changed again with Norton as the first part of the name - e.g. Eorton Bryne. Another reversal in the early 18th century gave rise to the first appearance of Brice Norton. 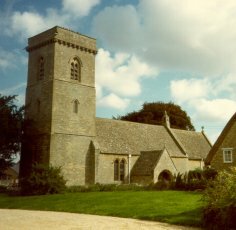 The prefix may have been altered to Brize by influence of the dedication of the church to St. Brice. There appears to be no good reason why the church should have been dedicated to St. Britius and it may have been because of the corruption of Brunes Norton to Brice Norton that the saints’ name became attached to the church, whose original dedication now appears to be lost. A Norman church, consisting of a chancel and a nave, was enlarged in the 13th century when a North aisle, Wenman Chapel and West tower were added. 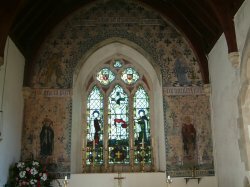 In 1868 G. E. Street carried out considerable restoration including the paintings on the East wa11, rood screen, screen to bell tower, pulpit, lectern, pews and benches, as well as the roof and South door. The church is a listed Grade II* building. 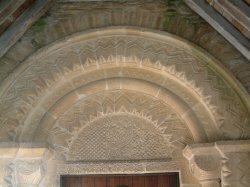 The arch of the late Norman doorway has three bands of zigzag decoration. 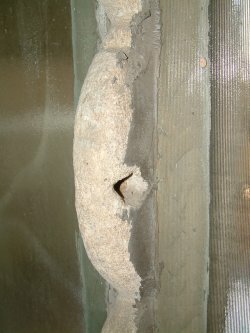 The outer band is carried on jamb shafts with cushion capitals, one carved with a pair of birds. On the tympanum (resembling a drum) is a chequer pattern with a symbol of the Tree of Life in the centre. 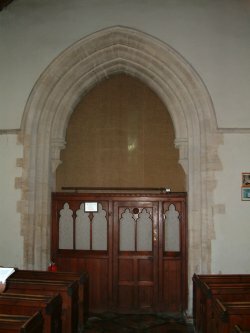 In the chancel South wall is a simple Norman priests’ doorway with a round arch. 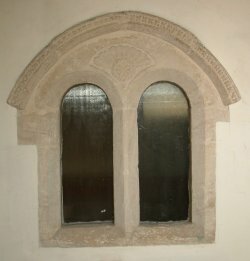 There is more Norman work opposite this on the North wall - part of a string course, with two arched openings beside it under a hood decorated with dogtooth, a fan and a circle in the spandrel (triangular space between shoulder of arch and right angle of frame surrounding it or between the curves of adjoining arches and a straight cornice etc. above them). This may have originally have been a reliquary as hooks remain for door hinges and holes for iron bars or a grill. This might therefore have once contained a relic of St. Britius which accounts for the fact that this church bears his name, the only one to do so in England. 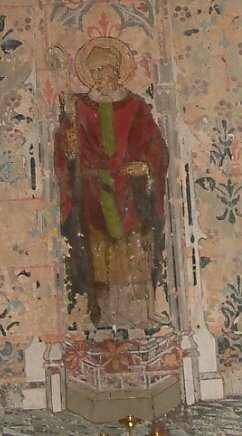 The East wall of the chancel is decorated with paintings, executed in 1893, of St. Britius and St. Frideswide - patron saint of Oxford. 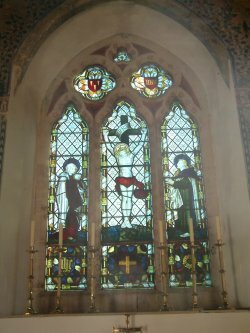 The East window is in the Decorated style but has been renewed, probably when the church was restored by G. E. Street in 1868. 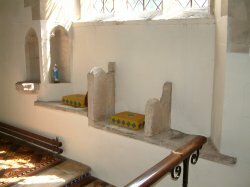 Below the South chancel window the sill is dropped to form sedilia (set of seats, usually of stone, and three in number, originally intended for the priest, deacon, etc., sometimes decorated or surmounted by a stone canopy) with the usual addition of armrests separating the seats. 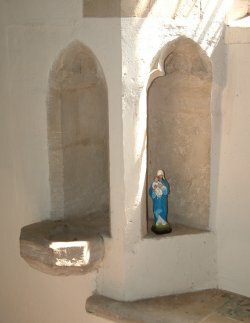 The piscina (stone basin near the altar used by the priest for washing hands or for cleansing the chalice after use) is also unusual, adjoining the jamb of the window and with a projecting bowl in front of a trefoiled recess. 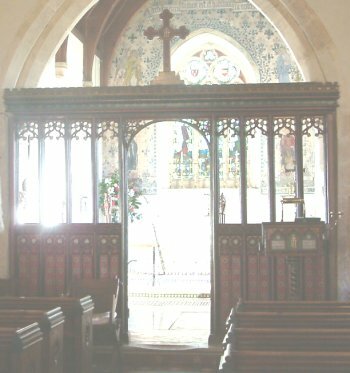 The chancel arch is of the Early Decorated period and has two chamfered orders, the inner supported on brackets, that on the North resting on the head of a man, renewed, that on the South on the head of a widow. 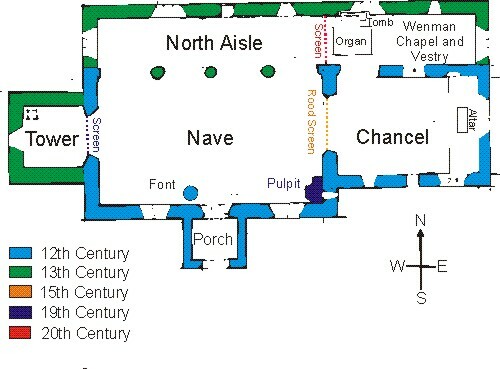 North of the chancel lies what was formerly the Wenman Chapel, now occupied by the organ and the vestry. This chapel appears to have been added about 1270. Behind the organ is the effigy of Sir John Daubyngne. He was a member of the great D’Albini family. 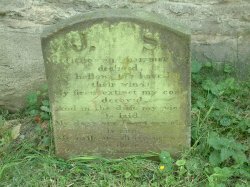 His family probably lived in Bampton, but appear to have owned no property in Brize Norton, so we do not know why his memorial should be here. The Latin inscription translates: Here lies John Daubyngne, who died on the eve of St. James the Apostle, in the year of our Lord one thousand three hundred and forty-six, on whose soul God have mercy’. If his date is correct, and the style of his armour agrees with this (of the period of King Edward III), he cannot have been a crusader. Crossed legs are a naturalistic pose typical of the period and have no connection with the Crusades. 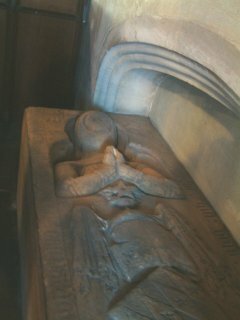 This effigy is of particular interest because of the way in which only the upper part of the body and feet are shown, the armour, and the wealth of heraldic detail. Coat of arms used by Brize Norton Parochial Council. The legs are crossed resting on a lion rather than a dog usually indicating a connection with the crusades, but then the dates don’t match! 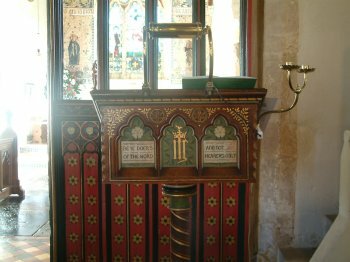 The rood screen is 15th century with modern decoration. 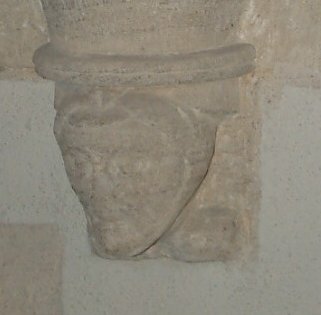 The Eastern nave arch rests on a large bracket terminating in the head of a knight. In the South wall of the nave the windows are Victorian. 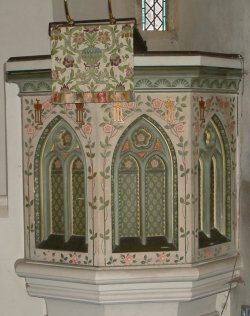 The pulpit, lectern and ceiling were also painted during this period. 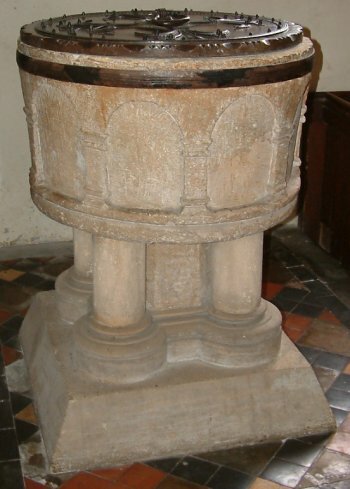 The font is Norman - a round bowl with a blind arcade of arches on flat rectangular shafts with a modern base. The tower arch dates from the second half of the 13th century. 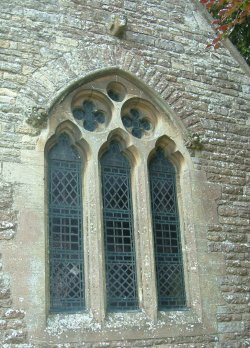 The West window is a plain single lancet. All the roofs are modern. The West tower contains a ring of six bells in the approximate key of A flat. The three stage tower is late 13th century. 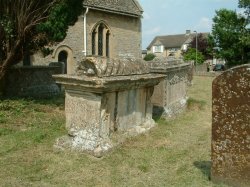 It has a plain parapet, and a corbel-table of stars, carved heads and billet (small half- cylindrical or rectangular blocks) decoration. On the East face the weather-moulding of an earlier and higher pitched roof remains. The outer arch of the porch is Transitional. 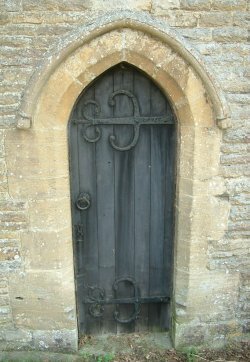 The North doorway is of the Decorated period with a hood mould that terminates in masks. 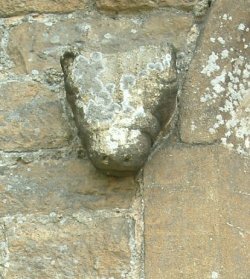 There is a corbel (stone bracket) with a muzzled head in the North wall. 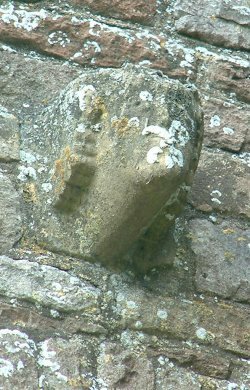 Above the East window of the North chapel is a corbel with a rams’ head on it. 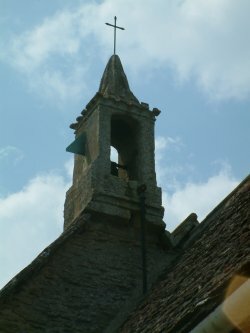 On the East gable of the nave, over the chancel arch, is a Late Perpendicular sanctus bellcote with spirelet and embattled parapet. 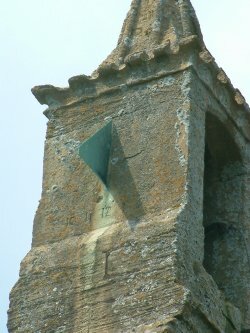 A later sundial has been carved on the South side. 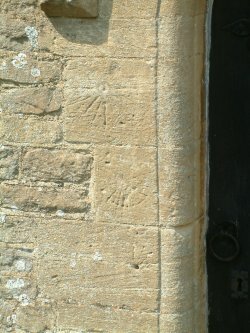 There are three roughly carved sundials on the West jamb of the South chancel doorway. Within the church there are several tombstones. 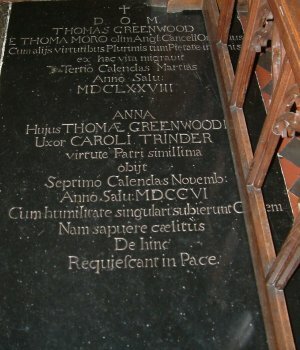 Thomas Greenwood who is buried in the church is said to be descended from a daughter of Henry VIII's Chancellor, Sir Thomas More. 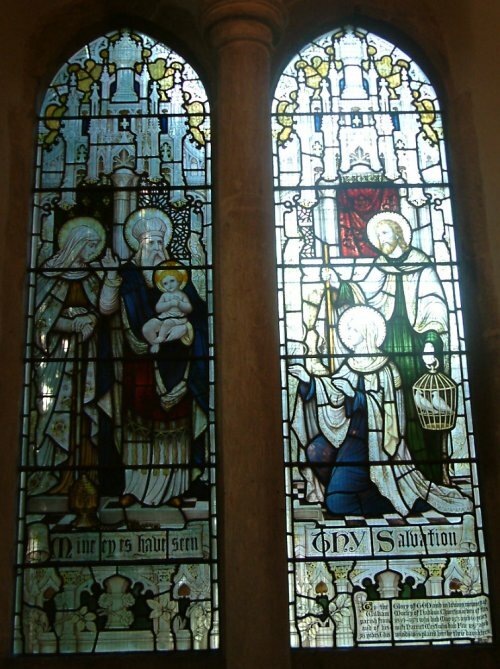 The Greenwoods, who were connected with the manor of Brize Norton for some 300 years, remained Catholics throughout the 17th century, but one member of the family was nominally Church of England to avoid paying the taxes imposed on Catholics at that time. The present churchyard lies across Station Road opposite the Church. 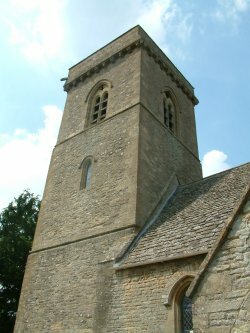 The Western tower contains a ring of six bells in the approximate key of A flat, all except the First hang in an oak frame made by Whites of Appleton. The third bell is dedicated to St Catherine. There is a Sanctus bell above the East gable of the nave. First, E sharp. 1884, 3cwt 2qr Olb, 2A 1 1/2in, J Warner k Sons (London) Inscribed: Omnia fiant ad gloriam dei / A Hedley 1884 / John Worley / Edward Hollis / Churchwardens. Second, E. 1873, 4cwt 1qr Slb, 2ft 2 3/4in, Mears & Stainbank (Whitechapel) Inscribed: George Ferriman, Vicar / John Worley / William Walker / Churchwardens. Third, D. 1873, 4cwt 1 qr 81b, 2ft 4 3/8in, Recast Mears & Stainbank (Whitchapel) Inscribed: as second bell. Fifth, B. 1873, 6cwt 1qr 21b, 2ft 9in, Recast Mears & Stainbank (Whitechapel) Inscribed: Reader thou also must know a resurrection or renewal. Tenor, A. 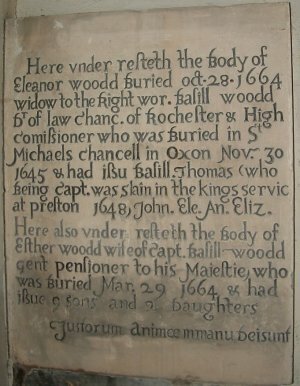 1672, 8cwt Oqr Olb, 3ft 2 3/4in, Edward Neale, Burford Inscribed: Thomas Boult / Simon Denton / John Eckley, Minister / Made M.E.F. / 1672 Edward Neale. The Tenor is listed in the Council For The Care Of Churches Schedule for the Diocese of Oxford. There is also an office bell dated 1693. The organ presents a simple and rather plain unfinished appearance. The fascia is of walnut but the bulk of the case to sides and rear is of tongued and grooved pine, unpolished and stained mahogany colour. 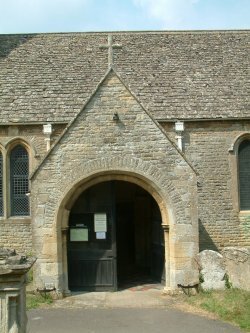 It stands on the North side of the chancel set back behind the 13th century arch which forms the entry to what used to be the Wenman Chapel from the chancel. Little is known about the history of this organ except that it is probably third or fourth quarter of the 19th century. It has been suggested that it was built by cannibalising other organs. A major restoration took place in 1986 when the pipes were cleaned, keys recovered, new springs affixed to the two manuals and a new electric blower installed. The pine boarding replaced diseased timber some two years earlier. The two manuals are of 4 1/2 octaves each and range from C to G with 56 notes while the foot pedals range from C to F (18) and C sharp to E flat (12). 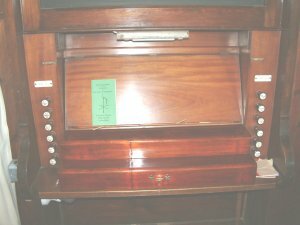 There are two central brass foot pedals and a wooden foot pedal set to the right hand side which, when depressed, closes the Fifteenth and Principal pipes. An interesting feature is the positioning of the 31 metal pipes, all of which are ”speaking”, placed at right angles to the manuals. 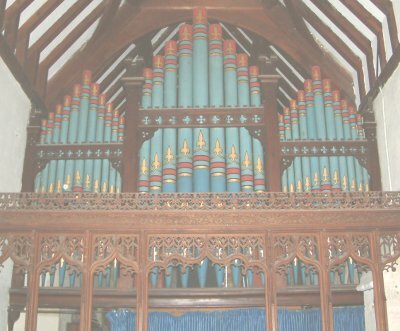 Brightly coloured and decorated, mainly blue with red and gold bands, these pipes face West onto the North aisle. They are set in three groups - 11, 9, and 11 - arranged in a fan pattern. Groups I and III measure 170cm. to 230cm. and group II measures 220cm. to 270cm. Above the organ itself are banks of exposed galvanised metal pipes.